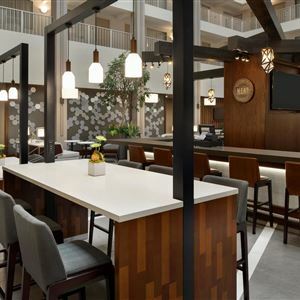 Property Location You'll be centrally located in Covington with a stay at Embassy Suites by Hilton Cincinnati RiverCenter, steps from Northern Kentucky Convention Center and close to Newport Aquarium. This hotel is within close proximity of John A. Roebling Suspension Bridge and Smale Riverfront Park. Rooms Make yourself at home in one of the 227 air-conditioned rooms featuring refrigerators and microwaves. Your room comes with a pillowtop bed, and all rooms are furnished with sofa beds. LCD televisions with satellite programming provide entertainment, while complimentary wireless Internet access keeps you connected. Private bathrooms with shower/tub combinations feature complimentary toiletries and hair dryers. Amenities Be sure to enjoy recreational amenities including an indoor pool and a fitness center. Additional amenities at this hotel include complimentary wireless Internet access, gift shops/newsstands, and wedding services. Guests can catch a ride on the complimentary shuttle, which operates within 2 mi. Dining Grab a bite to eat at the hotel's restaurant, which features a bar, or stay in and take advantage of room service (during limited hours). Mingle with other guests at a complimentary reception, held daily. Quench your thirst with your favorite drink at a bar/lounge. Business, Other Amenities Featured amenities include a business center, express check-in, and express check-out. Planning an event in Covington? This hotel has 8000 square feet (743 square meters) of space consisting of conference space and meeting rooms. Self parking (subject to charges) is available onsite. You'll be centrally located in Covington with a stay at Embassy Suites by Hilton Cincinnati RiverCenter, steps from Northern Kentucky Convention Center and close to Newport Aquarium. 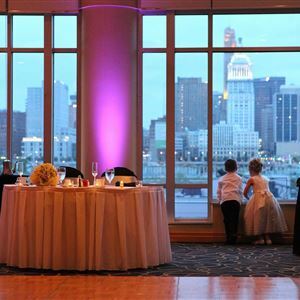 This hotel is within close proximity of John A. Roebling Suspension Bridge and Smale Riverfront Park. Make yourself at home in one of the 227 air-conditioned rooms featuring refrigerators and microwaves. Your room comes with a pillowtop bed, and all rooms are furnished with sofa beds. LCD televisions with satellite programming provide entertainment, while complimentary wireless Internet access keeps you connected. Private bathrooms with shower/tub combinations feature complimentary toiletries and hair dryers. Be sure to enjoy recreational amenities including an indoor pool and a fitness center. Additional amenities at this hotel include complimentary wireless Internet access, gift shops/newsstands, and wedding services. Guests can catch a ride on the complimentary shuttle, which operates within 2 mi. Featured amenities include a business center, express check-in, and express check-out. Planning an event in Covington? This hotel has 8000 square feet (743 square meters) of space consisting of conference space and meeting rooms. Self parking (subject to charges) is available onsite.